San Francisco and Santa Rosa deserve the spotlight when it comes to the great 1906 earthquake, but Petaluma also has a story to tell - and quite a valuable one, at that. Amazingly, Petaluma suffered no serious damage; no one was killed or even seriously injured. There were no fires. Walls of a few brick buildings collapsed. The 1908 state Earthquake Investigation Commission report gave the little river town only a short paragraph, noting "the great majority of chimneys fell." Petaluma escaped Santa Rosa's fate due to several factors. Much of the town is on solid ground that's been around since the dinosaurs, while Santa Rosa is mostly on soil that's just built-up silt from the Laguna's watershed. Santa Rosa's great fire damage can be traced to the crucial first few minutes after the earthquake, when Luther Burbank and other witnesses saw downed electric wires sparking in the streets and flames shooting from broken gas jets. In Petaluma the electricity was cut off outside of town almost immediately once the shaking began and their flow of coal gas - carried in a pipeline from Santa Rosa - was apparently likewise disabled, either blocked or lacking any pressure. We know a great deal about what happened in the little river town during and after the disaster because its excellent paper, The Petaluma Argus, kept publishing daily except Sundays and the day of the quake. The Argus also reported on what was taking place in Marin County as thousands of San Francisco refugees flooded across the Golden Gate on ferries and steamers. And best of all - as far as I'm concerned - the Argus covered what was going on during those weeks in Santa Rosa, providing details which have been otherwise lost. 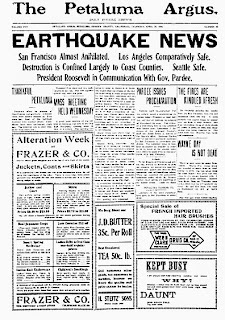 The following article explores exclusively the paper's trove of new information about the 1906 Santa Rosa earthquake. The Argus papers chronicled acts heroic in Petaluma, starting with the rush to aid firefighters in Santa Rosa. Over the following days the farming community mobilized to collect and boil countless eggs for San Francisco, as well as sending milk, butter, and meat to the desperate survivors in the city and outlying refugee camps. The town coped with waves of refugees that swelled Petaluma's population nearly threefold. But it's the Argus' daily observations that make for the most captivating reading. 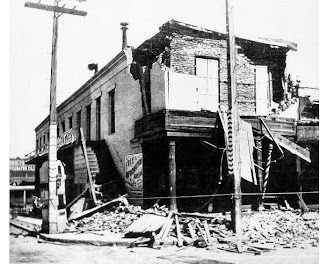 The quake struck near dawn on Wednesday, April 18, and the Argus from the following day described Petaluma's terrors during the first 36 hours after the catastrophe. Telephone and telegraph lines were down, preventing Petalumans from knowing the extent of the disaster - we read in other Bay Area papers published on the 18th that it was widely rumored at first that the entire West Coast was flattened. From a railroad worker they learned quickly that Santa Rosa needed urgent help, and a train from there soon brought the first refugees, mainly traveling salesmen from the demolished hotels and rooming houses wearing "nondescript attire," which probably meant whatever they could beg or borrow. "They are all dazed by their awful experience," reported the Argus. Worse, the morning train from Sausalito brought news that San Francisco was probably doomed. (In fact, the headline of the Oakland Tribune that day actually read, "SAN FRANCISCO DOOMED.") Ominously, the Argus told readers "rumor says that crowds of San Francisco are gathering on the Marin shores." Petaluma had very close social and economic ties to the city, judging by the great many items appearing in the Argus over the following weeks, updating readers that so-and-so was found to be alive or was now a refugee living with Petaluma friends or relatives. Crowds mobbed the train depot for each arrival; the police roped off the platform and stood guard to maintain order. A couple of days later the Argus described the scene: "As the scores of refugees left the cars the past few days, nearly all were grabbed by somebody and hugged and there were pathetic scenes on all sides. Women fainted on receipt of bad news, others wept with joy. Many became hysterical. Hundreds of private conveyances meet every train." Between worries about loved ones in San Francisco and fear of aftershocks, some walked the streets all that first night, and few slept in their beds: "Many local people were afraid to go to bed on Wednesday night and the parks were full of people who camped out all night." The first newspapers arrived the next morning, to great excitement. "The few papers received from San Francisco sold like hot cakes at fabulous prices. One was publicly read on Main street in the presence of an immense crowd." There were no signs of smoke coming from the south, which probably gave Petalumans hope the worst was over. "At noon however the smoke began to appear over the hills in huge volumes and from the sudden rising of white clouds of smoke it could be seen that dynamiting was being resorted to. The wind from that direction was warm and unpleasant." Refugees began arriving en force that evening; a train with 21 cars, requiring two engines, brought 500 people to town, "principally former Petalumans and people who have relatives or friends here and who knew where they were going." Meanwhile, the local relief committee was working to prepare the pavilion at Kenilworth Park (think Sonoma-Marin fairgrounds) for the homeless they expected to soon arrive. There were also apparently fears of anarchy in Marin county. An official from there arrived in Petaluma and bought all the guns and ammunition he could find. 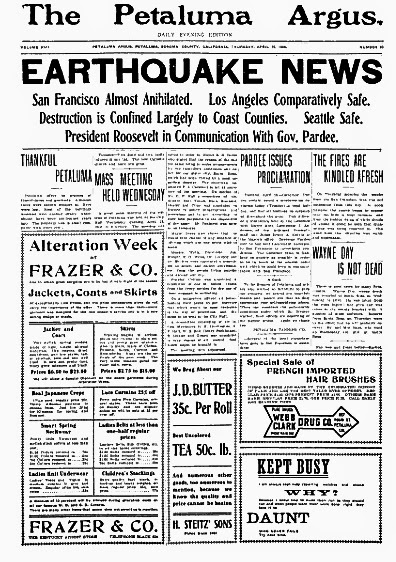 The Argus reported that San Rafael and all of the southern part of the county was under martial law. (That may not be true; the paper also reported the same about Santa Rosa, where it was never formally declared.) "Thousands of refugees from San Francisco are arriving from San Francisco and are overrunning the country," the Argus gasped, warning the town that it may find itself dealing with the hordes as well. "No doubt, the army will march northward and Petaluma should be prepared." The next day, the Marin county sheriff told Petaluma there were ten thousand homeless in San Rafael in urgent need of food. The Poehlmann Tanning Company collected all the donated eggs and boiled them in their huge vats. A large supply of food was also sent to Larkspur. Despite this aid, Marin pushed the panic button: "San Rafael can no longer care for her homeless charges and a special train at 3 o'clock on Friday P. M. brought several hundred to this city. They were met by a committee and escorted to Kenilworth Park where they will be made comfortable in the big pavilion and are being supplied with water." By Saturday - the third day after the quake - the Argus noted, "The population of Petaluma is today nearly 10,000." That was two-and-a-half times larger than its pre-disaster size of 3,900. Petaluma handled this refugee crisis with remarkable aplomb. The Kenilworth Park pavilion served only as a way station; by Sunday, no one was staying there. "The farmers are contributing supplies liberally and are offering accommodations for homeless," the Argus noted. "Citizens are putting up tents in their yards." If all that wasn't enough for Petaluma to deal with, they suddenly realized that weekend that repairs were being made all over town and "scores of chimneys are being constructed by people who know nothing of the business." That was no trivial problem: All of Petaluma's fire department gear was still in Santa Rosa, along with its hometown National Guard Company C. This left the town with nothing more than a volunteer bucket brigade if there were a conflagration. "Twenty special policemen have been sworn in as precautions against fires and are patrolling the city at night," the Argus reported, adding "There is great danger of fire and the insurance companies will pay no fire losses when occasioned by defective chimneys due to earthquakes." Let's skip ahead to April 25, a week since the earthquake: Telephone and telegraph service has been restored and the Argus tells us that life is getting back to normal, although "The relief committee is still working hard and in addition to feeding the people here, is sending food out to other cities." Marin still had about 12,000 refugees, but matters settled down after civic leaders got their act together and established refugee camps. The Argus had even dabbled with voyeuristic disaster tourism by offering a few "wandering in the city of ashes" reports about San Francisco conditions. Nope, not much going on - except for all the Sicilians camped out at Kenilworth Park. The Sicilians were fishermen (and their families?) from North Beach, and there was a whiff of racism in the Argus coverage. Readers learned a couple of days later that "chicken thieves are operating over at Kenilworth Park and vicinity" and there was griping amongst the group when the Relief Committee demanded work from some of the "big husky able-bodied men" getting free room and board. "They were becoming surly and dissatisfied and it was deemed wise to let them know that the local people are not to be trifled with," the Argus said. The Sicilians were gone by the end of the month. 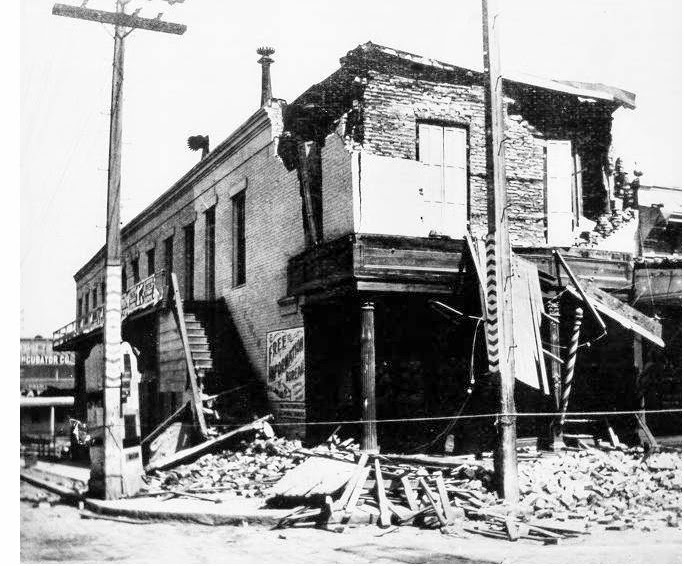 The Sicilian episode concludes the 1906 Petaluma earthquake story, more or less. There's more that you can read in the transcriptions below, but it was almost entirely news that happened elsewhere. On May 10 the Argus asked, "Isn't it about time for the newspapers to begin to print something outside of the calamitous catastrophe?" And yeah, so it was. But it's now about time there's wider acknowledgement of what Petaluma generously did for its neighbors when times were darkest. Selections from the Argus between April 19 and May 18 are transcribed below. Once again, the Argus reporting about Santa Rosa will be covered in the following article. Petaluma offers its prayers of thankfulness and gratitude. Although there were narrow escapes no lives were lost. Most of the buildings wrecked were ancient affairs which should have been condemned years ago. The property loss is small compared with other cities. Several of the local physicians have gone to San Francisco to assist there. On Thursday morning the smoke from the San Francisco fires was not noticeable from the city. At noon however the smoke began to appear over the hills in huge volumes and from the sudden rising of white clouds of smoke it could be seen that dynamiting was being resorted to. The wind from that direction was warm and unpleasant. San Rafael and all of southern Marin county is now under martial law. Thousands of refugees from San Francisco are arriving from San Francisco and are overrunning the country. As a means of self-protection, it was decided to place the county under martial law. A Marin county official arrived here on Thursday after firearms and bought up all he could get, together with ammunition therefor. No doubt, the army will march northward and Petaluma should be prepared. There is good news for many Petalumans. Wayne Day, whose death was reported at Santa Rosa on Wednesday is alive. He was taken from the ruins injured but alive and was taken to the county hospital with a number of other sufferers. Reports from Santa Rosa on Thursday were to the effect that he will probably recover. Mr. and Mrs. Russ, who went up Wednesday, are still at Santa Rosa. A number of the Santa Rosa survivors arrived here on Wednesday afternoon and were tenderly cared for. They were principally traveling men and they wore nondescript attire. They are all dazed by their awful experience. Mrs. H. H. Huntington of the Relief Committee returned on Thursday from Santa Rosa. She says that night gowns and beef tea are needed. The tea was bought by the committee and sent up. Night gowns are badly needed and should be left with the committee at the City Hall. Many local people were afraid to go to bed on Wednesday night and the parks were full of people who camped out all night. Others walked the streets. Scores of people slept on the steps and porches of their homes. The brick buildings were untenanted for the night, and the people occupying rooms in the brick lodging houses and hotels, sought refuge with friends in the residence quarter. The gasoline steamer Suisun City was nearly wrecked by the earthquake near Black Point. A member of the crew states that the boat was literally picked up and thrown back into the water. The crew thought the vessel would be shaken to pieces. The few papers received from San Francisco sold like hot cakes at fabulous prices. One was publicly read on Main street in the presence of an immense crowd. ...Tomales seemed to be in the track of the temblor as it twisted the track of the railroad so that there will have to be a new road bed made...The ground is cracked open for two miles in the county road beginning in the center of town and running north. There is not a chimney to be seen from Two Rock west. Coroner Frank L. Blackburn was summoned to Tomales Thursday to prepare for burial the bodies of two girls name Cauzza who were killed by the earthquake. The work of repair was commenced on Thursday. Brick masons are in big demand for hundreds of chimneys are down. The work of securing damaged structures is underway. Fully 1000 Chinamen from San Francisco have arrived at the fishing camps at Point Pedro and others are flocking to other fishing camps around the bay. They are quiet and orderly and are dazed at the destruction of Chinatown. The steamer Gold arrived here Thursday night with many refugees and on her arrival here waited only long enough for local ladies to make up bundles of sandwiches and boil many dozens of eggs. She took on water and then left on her errand of mercy. The Sonoma had gone out a few hours before with water and food. ...Thursday night fully 500 homeless people arrived here but they were principally former Petalumans and people who have relatives or friends here and who knew where they were going. All were provided for. The 5:30 train on Thursday night consist [sic] of 21 cars and 2 engines. A locomotive and five cars on the siding near Point Reyes station were completely overturned by the schock. [sic] Between Inverness and Olema the ground has opened, the fissures being two feet wide. It is impossible to drive that way. The big trestle above Tomales is gone. Wayne Day's body was found beneath the ruins of the Palm Garden Saloon on Friday afternoon. The news was received by a telephone message to W. Russ from Frank Day. Mr. Mrs. Russ left at one for Santa Rosa. During the absence of power on Wednesday the electric road used a steam engine to haul its cars. The Western Union Telegraph office is for the present located at the California Northwestern Railroad depot. The lines are up as far as Tiburon. The Sacramento Bee calle up the Argus on Friday as soon as the lines were in working order. The Bee had heard that Petaluma was in a bad way. The Argus gave the Bee all the information desired. Linemen of the telephone company arrived from Napa in an auto on Friday and went south. They are putting the lines in shape. San Rafael and Oakland could be reached on Thursday. Many of the San Francisco refugees were unable to secure beds on Thursday night and had to walk the streets. Twenty special policemen have been sworn in as precautions against fires and are patrolling the city at night. There is great danger of fire and the insurance companies will pay no fire losses when occasioned by defective chimneys due to earthquakes. Scores of chimneys are being constructed by people who know nothing of the business, and there will be great danger for a long time to come. A telephone message from Capt. Dickson at Santa Rosa to Fire Chief M. Flohr on Saturday afternoon says that the boys of Company C have reeled the city's fire hose and the two carts will be brought down on the afternoon train. The population of Petaluma is today nearly 10,000. Over 99 per cent of refugees are former Petalumans who have relatives and friends here. All knew just where they were going and all were received with open arms. As the scores of refugees left the cars the past few days, nearly all were grabbed by somebody and hugged and there were pathetic scenes on all sides. Women fainted on receipt of bad news, others wept with joy. Many became hysterical. Hundreds of private conveyances meet every train. The relief committee is composed of heroes and heroines and they are devoting all their time and energy to the noble work. The Salvation Army is a big help and the M. A. S. boys are working in regular detail. The Odd Fellows' Relief Committee is hard at work and the city trustees and city officers are busy. Not one person is now at Kenilworth Park as all have thus far been provided with homes. The farmers are contributing supplies liberally and are offering accommodations for homeless. Citizens are putting up tents in their yards. A big force of special police officers has been appointed for fire purposes as they are not needed otherwise. The order is perfect and not one arrest has been made. The steamers brought in but few people Friday night and at 9 o'clock the streets were quiet. At this time a special meeting of the city trustees is being held and fire department and other city officials are present. Buildings are being condemned and stringest [sic] arrangements are being made for the town's safety. There is plenty of food here and nobody need suffer except from inconvenience. There is no need of alarm or unrest. Things are looking brighter. During this terrible time of trouble the place of heads of families is at home. By going to San Francisco you are only adding to the confusion which is already hard to cope with and you can do no good there. You may be called upon at any moment to extend assistance in your own homes to the distressed and destitute and you are requested to keep all available space ready for prompt use, if called upon. The telephone and telegraph offices were besieged with people on Saturday seeking to send messages to relative and friends. Sad scenes were enacted at both offices. Sheriff Taylor of Marin County telephoned Friday morning to this place and stated that 10,000 homeless people are now in that city and asked for aid. Mr. Poehlmann of the Poehlmann Tanning Co. has taken all the eggs which egg dealers have donated and is busy boiling the eggs on the large furnace at the Tannery for the purpose of sending them to the homeless and hungry. San Rafael too has asked for aid. Many local ladies are at work under the auspices of the General Relief Committee and a large amount of food was sent to Marin county on Friday afternoon. Larkspur appealed for food on Saturday and a big consignment was sent down from here by the Relief Committee. The valley is full of refugees. Since 1 p.m. on Friday, nobody is allowed to land in San Francisco so there is no use for anybody to try it. The soldiers at the wharves prevent persons without passes to land. Don't try to go to San Francisco, it is useless. In this city everything is quiet and peaceful. Of the hundreds of refugees now here, all except 100 are with relatives and friends and are so scattered that few people would believe that our present population is about 10,000. Ranchers are now taking whole families to keep until matters are adjusted. The relief committee is still working hard and in addition to feeding the people here, is sending food out to other cities. The work is being carried on in the same systematic manner without fuss and with great credit to the committee and the city. Supplies are still coming in...Business is going back to its normal condition and the people are regaining confidence. Petalumans can feel with satisfaction that in the great emergency they have done nobly. Company C came home on Saturday evening but was soon after its arrival again ordered under arms and returned to Santa Rosa on the 7 o'clock train. At first the Company was ordered to Oakland but later it was decided to keep it in Santa Rosa. A new camp has been pitched on the private grounds of the residence of Mayor Overton on Fifth street. A. Matsen is the company cook, and the boys are faring well. On Monday workmen were repairing the American Hotel, electric light station and National bank. Others were tearing down the front of the Lynch building and the cornice of the Dan Brown estate building. Less than a score of refugees except those having relatives and friends here, arrived from San Francisco Monday. All are well. The health authorities inspect all arrivals. The exodus from San Francisco has ceased. Telegraphic communication between Petaluma and San Francisco has been restored. On Sunday two wires were connected with a temporary office at the metropolis and many messages were gotten through. The greatest difficulty is in finding the persons for whom there are messages. Local people expecting telegraph messages from friends or relatives are requested to call for same at the depot. The Examiner was issued on Friday, being printed at Oaklad [sic]. The few papers received here went quickly at high prices. All of the eggs and butter which was shipped Saturday to Oakland has been returned. Scores of former residents who are now here were house hunting on Sunday and Monday. It is reported that the dead in San Francisco are being placed in barges which are being towed far outside the heads and sunk in the ocean. The city's fire hose which has been at Santa Rosa were brought back Saturday night. The hose carts were placed on a flat car. Captain Dickson of Company C reeled and shipped the hose. Four lengths were burned. The pipe line which conveys the gas from Santa Rosa to Petaluma, was on Monday found to be uninjured. This assures a plentiful supply of gas on Tuesday and Wednesday, and is grand news to all. The farmers of this vicinity are doing nobly in contributing to the food supply. Hundreds of dozens of eggs, milk galore, bread and other supplies are being contributed. One farmer brought in three whole carcases of veal. Another brought five boxes of fresh butter wit a request to sell same if it could not be used and turn the money into the fund. Letters are being received here from San Francisco without envelopes or stamps. The street leading from the foot of Western avenue to the river is closed owing to the unsafe condition of the walls of the Wickersham building. A few refugees arrived here by steamer on Tuesday night. Up to the time of writing, however, none arrived here on Wednesday. All is quiet at Kenilworth Park where one hundred Sicilians are encamped. They are being well fed and well cared for. A number of priests arrived here on the morning train Wednesday. Will Ortman on Thursday received a letter from his brother, George Ortman, who is a deputy sheriff of Marin county. He says there are 12,000 refugees in Marin county and they are doing well. He states that the sheriff's office thanks the Petaluma people for the supplies sent. The local police are still on duty at all trains but it is no longer necessary to rope in the crowds. Chicken thieves are operating over at Kenilworth Park and vicinity and many fowls are reported to have been stolen during the past few nights. A determined effort will be made to apprehend and punish the offenders. Three wrecked coaches of the California Northwestern railroad passed through Petaluma Wednesday night on the way from Santa Rosa to the Tiburon shops. Another party of Sicilians arrived from San Francisco Thursday and are at the refugee camp. On Friday Gil P. Hall, the life and head of the local General Relief Committee, went to the refugee camp with a big express wagon and took eleven big husky able-bodied men who were there, out to the rock crusher and put them to work. The men, it is said, have considerable property with them. They were becoming surly and dissatisfied and it was deemed wise to let them know that the local people are not to be trifled with. The men saw it was of no use to protest so went to work at the Hillside rock crusher. At McNear's Point Pedro property no damage was done. The two large brick kiln chimneys are uninjured . The McNear family are feeding about three hundred of the Chinese refugees. The fishermen are catching fish and sending it free to Oakland and San Francisco. Mr. Stempel, who returned on Thursday from the coast, says that we have no idea of the intensity of the earthquake out toward the coast and says that the shock in Petaluma must have been nothing as compared to the shock out on the coast. He states that the scene along the route of the tremblor is far beyond the powers of description and the typography of the country is considerably changed. Scores of frame buildings were demolished and not a stone foundation, no matter how small, or a chimney is standing. The railroad track and bed was picked up bodily and thrown over into a field. The big trestle at Fallon is gone and there is demolition on every side. Near Walker's bridge the hills have moved together and the bridge is several feet too long. Driving inland, the effects of the earthquake gradually appears less. Workmen are removing a section of the north wall of the First M. E. church which was damaged by the shock. Repairs will be made at once. Santa Rosa is employing the prisoners in the county jail in clearing away the ruins in Santa Rosa. An Italian, who is presumed to have come up from San Francisco since the great disaster, hung himself on the Dry Creek bridge near Healdsburg Wednesday morning. He was about thirtty years of age and was unknown to any of his countrymen there. It is supposed that his mind was unhinged by the earthquake shock. Slight shocks of earthquake are so numerous that they no longer alarm the people. A young lady belonging to a prominent local family, has been very ill owing to the shock and to the death of near friends and has temporarily been bereft of her reason. She is being cared for by nurses and attendants, but it is feared that she must be sent to a sanitarium. The case is a very sad one. A large party of the Sicilian refugees, who have been at Kenilworth Park, returned on Monday to San Francisco. The relief work in San Rafael has been excellently organized and the San Franciscans who sought refuge in that town have naught but words of the highest praise...The Coleman tract, a sightly, sanitary place, contains the tents for the housing of the homeless, all under the care of Dr. Crosby. It is equipped with telephones, electric lights and other conveniences and is a model relief camp...A.W. Foster and family have also been tireless in the work of relief. He has erected tents on his grounds and has one son in a bus meeting trains and making the rounds of the camps to take those who wish to go to the Foster ranch...there is no suffering and there will be none in San Rafael. EXAGGERATION AND MISSTATEMENTS ARE A DETRIMENT TO ALL CONCERNED. ...It is now ascertained that in the great city less than 300 lives were lost and at Santa Rosa there were less than 80. We were shocked to receive from a publishing firm in Chicago a book of 200 pages, in which were all sorts of misstatements and exaggerations made, doubtless with the sole purpose of making money out of the great calamity of California...if those at a distance could see the demonstrations already being made in the two cities that has been so terribly shocked and in which so much destruction has been experienced, to rebuild and restore themselves and even the work already accomplished in the revival of business, their lack of confidence would be speedily restored in favor of California, that has been shattered by the stores that have been told them by unprincipled parties. A party of refugees passed through town Tuesday morning with a pack train and attracted much attention. People of Petaluma, your work for humanity has not ended and there is yet much to be done and it must be done now. Down in the refugee camps in San Francisco, women and children are in dire want, and it is up to the good people of Petaluma to keep up the splendid work begun by them. To an Argus reporter on Tuesday Mayor Overton expressed his great appreciation of the splendid manner in which the citizens of Petaluma aided the stricken city. All over Santa Rosa the Argus man heard words of praise for Petaluma, and it made him feel good. Company C is camping on the splendid lawn at the Edwards home on Fifth street, Santa Rosa. Mrs. Edwards is mother of MRs. Frank H. Denman of Petaluma. Several automobiles, northbound, passed through town Wednesday morning. A curious freak was the rise in Russian River and the outbreak of many new springs throughout the mountains. Ed Ensler an old time resident of Valley Ford, was found dead on the floor of his cabin on Tuesday night. Deputy Coroner Tom Wilson drove out on Wednesday and held an inquest. Death was due to natural causes. The old man had been ailing for some time and his death was hastened by the earthquake shock. He was a county pensioner and had no relatives as far as is known. He was a native of Holland aged 75 years and was unmarried. He lived for a long time on the Patterson place. The remains were brought to Petaluma by Mr. Wilson and on Thursday morning were laid to rest at Cypress Hill Cemetery. He was buried at the expense of the county. Since the San Francisco disaster Petaluma has become quite a journalistic center. At the Argus offices, besides the printing of the local paper, the composition for the Marin Journal and part of the Santa Rosa papers, the Argus is doing the printing for the Brunt office of San Francisco, and is printing the Labor Clarion, the Trestle Board L'Italia and La Svizzera, all of San Francisco. It has been reported here that the instantaneous shutting off of the current at the local plant prevented the destruction of this city by fire on the morning of the earthquake. Manager Weber of the Petaluma Gas and Electric Co. states that this is incorrect. The shock of the earthquake swung and broke the main power line and blew out fuses in a hundred different places. The main line broke in two places here and on in the yard east of the power house and the San Rafael main line broke just east of the D street bridge. There could be no fires from electric wires at Santa Rosa because before the buildings went down the power was off. An Argus reporter, who was in a down town building, saw the flash when the power stopped and it was during the early part of the shock. Mr. Weber believes that most of the fires started from stocks of matches in the grocery stores although some were no doubt kindled by lamps and by stoves. Up at Colgate where the "juice" is generated, no shock was felt. Not until the load went off the machines did the electricians know that anything had happened and even then they did not know what was the matter. Santa Rosa, May 8--There was a serious collision on the Petaluma & Santa Rosa electric railway yesterday afternoon between a work train clearing away debris in this city and a train which was emerging from a siding at Sebastopol. Two cars were wrecked and thrown into a ditch, while one end of a motor passenger car was demolished. A number of laborers from this city were going to Sebastopol to unload the debris, but they jumped from the cars and escaped. Several were badly bruised. The train crews have been laid off pending an investigation. Isn't it about time for the newspapers to begin to print something outside of the calamitous catastrophe? But then there is so much of it that it requires a spirit of negation to get outside of it. A number of refugees who found shelter at San Rafael at the time of the San Francisco fire are still receiving aid from the relief committee. At first there were 200 sheltered at the relief camp, but the number rapidly decreased until there are now about ninety persons, mostly old men, women and children. The city trustees have adopted an order giving refugees a chance to work on the streets for $1 a day and board. It is estimated that nearly 4000 refugees have found shelter among friends in that city. William Newcomb, a resident of Healdsburg, where he was a fruit grower of the Dry Creek Valley, was adjudged insane Saturday by Judge Emmet Seawell and ordered committed to the Ukiah asylum. Newcomb had been failing before the earthquake, but the tremblor completed the wreck of his mind. The work of caring for the refugees sheltered in Marin county was Wednesday transferred to Captain West and Lieutenant Swift, ordered there by General Greeley. A troop of cavalry accompanies the officers. The soldiers will be encamped at San Rafael. Colonel E. B. Martinelli of the local Red Cross will assist in the relief work. There are two thousand refugees throughout the county. Last Sunday Colonel and his associates went to Ross Valley where there are many destitute refugees. It was discovered that over seven hundred persons not entitled to public aid were drawing rations. Some of them were local property owners and possessed of good credit at the stores. The committee stopped their rations. Coroner Frank L. Blackburn of Petaluma presented a bill of fifty dollars to the Board of Supervisor for holding all the inquests over the bodies of the victims of the earthquake, and then presented this amount to the relief fund for those who were afflicted and lost their belongings in the trying times. Had he made the usual charge allowed in each case, the coroner's bill would have amounted to many hundreds of dollars, but Coroner Blackburn did not desire to take advantage of the misfortune by making money for himself. In his action he has shown a commendable public spirit.-Republican. Coroner Blackburn could have put in a bill for $750 under the law under the law and it would have been a just and correct bill and would have been passed by the supervisors without a word. But he chose the course which will go down in history in Sonoma County. During the awful days following the disaster the Coroner was in the thick of the rescue work and neither ate nor slept. For several nights he remained on duty at Santa Rosa without removing his clothing. During that time he spent much money out of his private purse and was a relief committee all by himself. He assumed personal charge of removing and disposal of the victims of the disaster and aided in the search of the ruins. He was everywhere and nobody worked harder than did the popular and painstaking official. Not only is Petaluma proud of his record and generous action, , but the whole county is singing his praises and it does a Petaluman good to hear it.